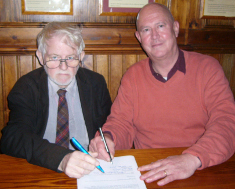 Peter Scott-Presland (right) and CHE Secretary Griffith Vaughan Williams sign the contract for the book at the November 2010 Executive Committee meeting, less than two weeks before Griff's untimely death. 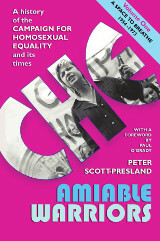 As Britain's leading LGBT organisation for many years, CHE, and its local groups around the country, played a vital part in the gay and lesbian life of the country, and the story of CHE is a major part of the story of the advance of LGBT people from 1964 onwards. We were determined that the story of CHE, and the many people who were involved in it, should be recorded for posterity, so the Executive Committee decided in 2010 to commission a book about the history of CHE and its times. The distinguished author and playwright, Peter Scott-Presland, has been given the job of researching and writing the book. Once Peter started to get to grips with the task, he found that the amount of material available is more than enough for a single volume, so the book is now planned to be issued in three parts, with the overall title Amiable Warriors . The first volume, A Space to Breathe , covers the period from the 1950s to 1973, and was published in February 2015. An extract from Chapter Three, entitled 'The Battle for Burnley' was published on 7 October 2014, as part of the celebrations of the 50th anniversary of the founding of the committee that developed into CHE. There are two Appendices (a timeline of events and a list of local groups) plus a full bibliography and a comprehensive index. For the latest news on the book, see the new dedicated website: www.amiable-warriors.uk.